It feels weird to confess but I’m addicted to a fragrance! Believe it or not but I’m really, really enamored with this fragrance from Oriental Botanics. 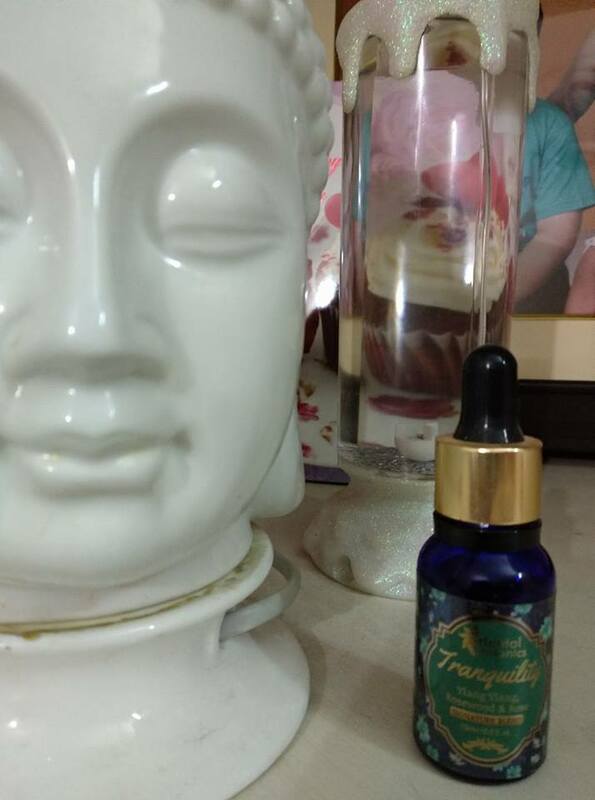 It’s called Tranquility and it’s an essential oil that costs a whopping INR 899 for mere 30 ml, which is a lot for a diffuser oil, but then it’s pure essential oil and it smells almost supernaturally good – roses in spring, cooling sherbets on hot summer days, gorgeous girls in lace dresses and passionate kisses from handsome hunks…. Now come on, doesn’t that sound really good? Anyways, jokes apart, using an essential oil diffuser or aroma candle in your room can actually enhance your mood, improve your health, increase your energy and help you sleep better. There’s something about aroma oils and stress, that lighting an oil diffuser at night just feels like the right thing to do. 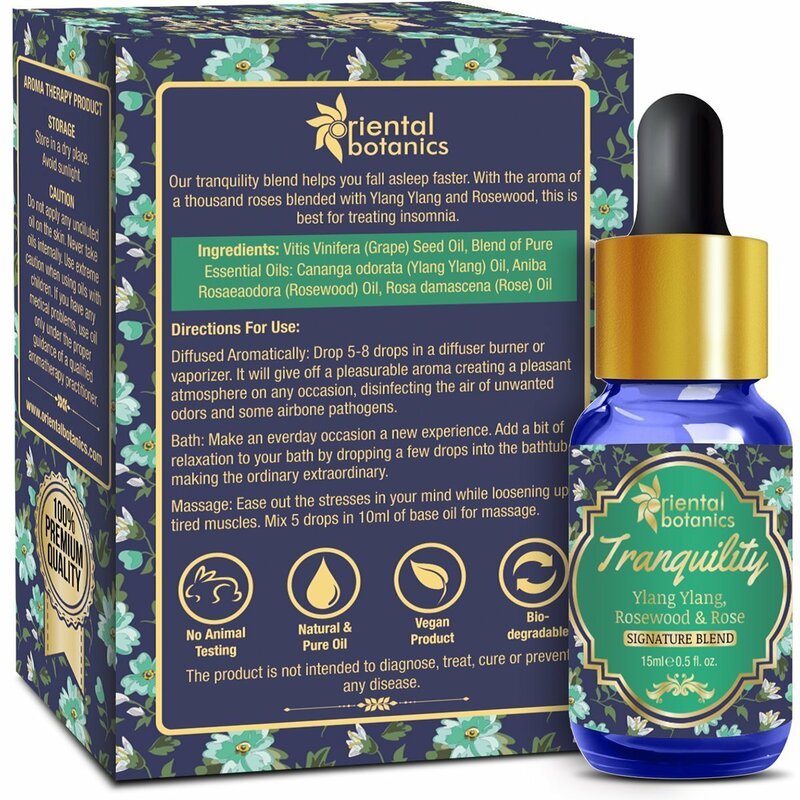 I have been using this Oriental Botanics Tranquillity Aroma Therapy Diffuser Oil in my room for weeks now and it has definitely helped in the quality of my sleep and mood throughout the day. I feel more happy, romantic, and positive. Here’s a brief review of this aroma diffuser oil to help you know more about this product. The company describes its product as an essential diffuser oil blend to help you sleep faster. The product contains a fusion of essential oils of Rose, Ylang Ylang, and Rosewood. This blend is best for treating insomnia. Vitis Vinifera (Grape) Seed Oil, Blend of Pure Essential Oils: Cananga odorata (Ylang Ylang) Oil, Aniba Rosaeaodora (Rosewood) Oil, Rosa damascena (Rose) Oil. Aromatherapy, Custom Massage and Body Oils, Vaporizers, Diffusers, Oil Burners, Inhalation, Perfume, Blends, Spa. Diffused Aromatically: Drop 5-8 drops in a diffuser burner or vaporizer. It will give off a pleasurable aroma creating a pleasant atmosphere on any occasion, disinfecting the air of unwanted odors and some airborne pathogens. Bath: Make an everyday occasion a new experience. Add a bit of relaxation to your bath by dropping a few drops into the bathtub, making the ordinary extraordinary. Massage: Ease out the stresses in mind while loosening up tired muscles. Mix 5 drops in 10 ml of base oil for massage. I personally prefer to use this oil in a diffuser at night in my room. I’ve tried other fragrances too, like Rose, Lavender, Citronella, Sandalwood, lemon-grass etc. but Tranquility has become my current favorite for the bedroom. The aroma is ultra-soft and calming, yet powerful enough to fill my whole room with its opulent scent. No matter how tired I am at the end of the day, as soon as I enter my room, the magnificent aroma of romantic roses, calming rosewood and invigorating ylang ylang submerge and cuddle me to the most relaxing sleep. Sometimes, when I light my diffuser set, I just use my imagination to pretend I am at spa and then let the scent work its magic. And girls, it’s actually surreal and magical! I wake up with an amazingly energetic and radiant body! The best part about this diffuser oil is that it smells totally natural and soothing with nothing artificial or chemical about its scent. Also, the packaging in royal blue glass bottle with black and golden dropper looks totally classy and luxurious. Anyways, that was all I have to say about the benefits of essential diffuser oils in general and Oriental Botanics Tranquility Aromatherapy Diffuser Oil in particular. Hope you enjoyed reading the review and found it useful. How do you feel about using diffuser oils in your room? Are you too a fan of scentifying your room with different fragrances? I can’t be the only one who’s addicted!